The Torah of the Most High contains many and varied commandments. Well over two-hundred fall into the category of “you shall not,” while more still are in the category of “you shall…” These are grouped into categories called “negative” and “positive” commandments, respectively. Some are prohibited to us, and some are encouraged for us to engage in. The traditional count of all of them combined has generally been a total of six-hundred and thirteen (613). This very specific count encompasses all the commandments we are called to live by as citizens of the Kingdom of Heaven. Our duty, our privilege of serving the Creator falls within the boundaries of those holy edicts. 4 Hear, Yisra’El: YHWH your Elohim, YHWH is one. 5 And you shall love YHWH your Elohim with all your heart, and with all your soul, and with all your very-ness. This passage is on the lips of the faithful first thing in the morning, finally before bed at night, and is typically the last utterance of a heart to the Holy One before it ceases to beat. The greatest commandment has received careful attention and application so that it forever remains such in both knowledge and deed. The centrality of the Shema in Judaism is probably most succinctly seen in the Talmud Bavli, Sukkah 42a. In this passage of the ancient Jewish text, the context revolves around what the duties are of a father to his son. 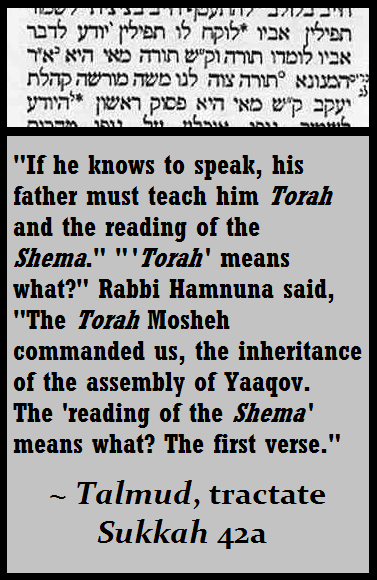 The imperative nature of knowing the Shema is blatantly conveyed by this brief declaration of a father’s duty. A child usually learns to speak at a very young age, prompting the father to begin his role of educating his son about the greatest commandment just as early on. The reason for this is to instill in the child a desire to be a part of the community of faith in the Holy One. The child of the believer has an inheritance if they will claim it. That inheritance is the Word given to us by the Most High that makes us part of His people forever. Scripture calls us to pass the divine inheritance on to our progeny, if we are given such, to build up the next generation for the purpose of making a positive difference in this world. If they don’t know who they worship, the only difference they will ever make will be a negative one. The teaching of the Shema is to instill the reason for all that we do in this life. For a child to understand the identity and the nature of who they worship is to set them a framework through which they will view all of life. Thus, learning this commandment of commandments brings the son into a fealty for the King, as the Mishnah, Berachot 2:2 illuminates. By declaring the validity of the greatest commandment, a person is immediately said to be living for “the Kingdom of Heaven.” Additionally, this is known in Judaism as taking upon yourself the “yoke” of the Kingdom of Heaven. The Shema is therefore seen as the believer’s declaration of allegiance to the Holy One Himself. If one has ever pondered the precise Jewish meaning of the phrase “Kingdom of Heaven” or “Kingdom of God” as it is encountered in the Word, where it was spoken by a Jewish man to Jewish people who understood Him in a Jewish sense, it is now laid forth: The Kingdom is the reality of a person living within the declaration of the preeminent status of the Holy One in their lives. ​It is the performance of the commandments that chains us to the heavenly realm, connecting us to the Kingdom of the Holy One through actions of eternal merit. It is not a future world that shall come, or at least, it is not limited to such a future interpretation and actualization. Rather, it is the right-now situation of a person who has performed the fulfillment of the heaviest / greatest commandment of them all – the Shema. Proclaiming the truth of His mastery in our lives in the performance of the Shema procures an immediate reward: connection to the Kingdom of which He is the Ruler. The centrality of the Shema as the greatest commandment in Scripture is probably most popularly known from its context in the Gospels. Particularly, the book of Mark 12:28-34 gives us the account in a straight-forward fashion, picking up from a conversation the Messiah Yeshua had been engaged in with a group of Sadducees. 34 And Yeshua saw that he wisely returned word, and replied and said to him, “You are not far off from the Kingdom of Alaha!” And no man presumed that he should question Him. The above translation from the Aramaic of the Peshitta has Yeshua answering by quoting the text of Deuteronomy 6:4-5 regarding the greatest commandment in the Torah. This account is significant in that it shows Yeshua’s view aligned with the traditional Jewish view of the most important commandment in the Torah – the Shema. The scribe, a man immersed in the Torah every day, would have been well-aware of the religious viewpoints of the time, hearing them in the various rabbinic schools daily, and would have certainly been familiar that the most important of all commandments is the Shema. Seeing how Yeshua – a rabbi whose religious pedigree was admittedly unknown to either the Pharisees or the Sadducees – was handling Himself so expertly with them, the scribe was moved to ask of Him His view of this very important topic. The answer Yeshua gave was not only correct, but it absolutely aligned with the perspective of the leading schools practicing Judaism in first-century Israel. Additionally, the mention of the “Kingdom of Alaha” by Yeshua to the scribe is directly related to the topic of the Shema. Recall that the phrase “Kingdom of Heaven” was used in the Mishnah, Berachot 2:2, and there was said to be obtained by making the heartfelt declaration of the Shema. This should not pass by our attention. It is altogether telling in that it relates immediately back to the closing statement Yeshua made to the scribe: “You are not far off from the Kingdom of Alaha!” It should not be forgotten that the phrases “Kingdom of Heaven” and “Kingdom of Alaha” are synonyms in both the New Covenant texts and in Judaism referring to the coming Messianic Kingdom. In fact, the direct phrase “Kingdom of Alaha / God” is mentioned in the Messianic Scriptures a total of sixty-eight (68) times, and the phrase “Kingdom of Heaven” is mentioned there thirty-one (31) times, showing a marked preference by Yeshua for the more commonly-found expression in rabbinic Jewish texts of “Kingdom of God.” When He spoke of the “Kingdom of Heaven / Kingdom of God,” He was referencing the performance of the commandment and the lifestyle exhibited in the declaration of the Shema / Deuteronomy 6:4-5. It is very important to understand the Hebraic way in which the phrase was used in the New Covenant writings, so that improper concepts do not creep into the true faith. Yeshua’s position on the greatest commandment of the Torah is linked to His role as the Messiah who would give His all to perform the will of the Holy One. The Creator desired of His Messiah to fulfill the Torah in completion, and that is what Yeshua appeared to do: the will of the Holy One in living the Word in a flawless manner from greatest to the least commandment. His perfect performance of the Shema was not only a taking upon Himself the yoke of the Kingdom of Heaven, but qualifying to be the King of the Kingdom! In fact, the concept that the King Messiah would take the Torah upon Himself to perform the true intent of the Shema was a view expressed in ancient Judaism and heard in the synagogues of Israel during first century times when the Aramaic translation of the prophet Isaiah 9:5 (6) was read, as we see written in the Targum Yonatan to that prophetic verse. All this shows us that the greatest commandment is viewed in a vital light for all who seek to be a part of His Kingdom. Make no mistake about it: Our entrance into the Kingdom is predicated upon us performing the greatest of all the commandments, just as the King Messiah took it all upon Himself to perform without blemish. The reward for performing this commandment – the mere declaration of such – is to be found as a citizen of the Kingdom, assuming upon ourselves all that comes with living in the community of faith. It is interesting to contemplate such reality: the “beginner” is expected to perform the most important of all commandments that can be kept. Yes, others are significant, and should not be ignored, but our initial Torah performance of that which is viewed as the greatest is a necessity. One does not “work their way up” through performances of commandments of varying significance – inclusion in the Kingdom mandates the individual give all he has to the One who is giving all He has for him. The voice of Judaism is united in this area: we must acknowledge who we worship and love Him with all that is in us. When we do this, we are rewarded with a place in the Kingdom, voluntarily accepting the divine yoke of the reality of His truth in the world: He is the Creator and deserves our worship in the way He has told us to worship. And yet, while the greatest commandment is widely taught in Judaism and promoted to be performed by even the most recently-received of the faithful in His Kingdom, we cannot leave out the reality of the other end of the spectrum: the least commandment. If the weightiest of the commandments brings about as reward for the performer an entrance into the Kingdom of Heaven, what manner of reward would the lightest of the commandments incur if performed? The answer might be surprising, but it is actually intimately connected with the reward for the fulfillment of the greatest commandment. 17 Do not suppose that I came to dismiss the Instruction or the Prophets! I have not come that I should dismiss, but instead, that I should fulfill! 18 For I truly say to you: that until the heavens and the earth shall pass, one yudh or one stroke shall not pass from the Instruction, until all shall have happened. 20 for I say to you, that if your uprightness is not excessively more than the scribes and the Preeshe’, you shall not enter unto the Kingdom of the Heavens! The declaration by Messiah is not only should we pay attention to the greatest commandment, but we shall be held accountable for how we view and perform the most minor commandment, as well! If even the least of the Torah’s commandments is neglected, serious consequences will follow. Unfortunately, this detail of Yeshua’s words is often not given much further consideration. However, it is interesting that a Jewish rabbi who flourished not long after Yeshua, in the early second century, made a similar statement about performing the greatest and the least commandments. It is recorded for us in the Mishnah, Avot 4:2, where Shimon Ben Azzai shares a similar, but less severe, sentiment as Yeshua did in Matthew 5. He tells us to “run after” great and small commandment alike. Our pursuit of His ways is to be so devoted that our Kingdom experience is to treat all the commandments with equal desire to perform. The least commandment, although by very reference different than the performance of the Shema, should be performed with the same spiritual fervor and sincerity as the Shema. The words of Shimon Ben Azzai thus echo the astounding declaration of Yeshua concerning the warning of neglecting even the lightest of all commandments. As it stands, the specific identity of the least commandment is not highlighted as such in the Hebrew Scriptures or the New Covenant writings. Instead, one needs to return to the Talmud to gain further details about it. The identity of the least commandment is stated in the Talmud Yerushalmi, tractate Kiddushin. This reference to the least commandment is to a brief decree explained in two verses from the last book of the Torah. In Deuteronomy 22:6-7, we find the commandment that is viewed as the least of all. 6 If you encounter a bird’s nest before you in the way, in any tree, or upon the ground – nestlings or eggs, and the mother laying upon the nestlings or upon the eggs, you cannot take the mother upon the sons. 7 You must certainly send away the mother, and the sons take for yourself, so that good shall be for you, and your days shall be lengthened. This commandment is given the placement as the ‘lightest of the light’ commandments in Judaism. Although there are many commandments that could be viewed as very "small" or "light" in their application or opportunity for observance, this one was chosen from ancient times as the representative of the most minor of all 613 commandments! The decrees surrounding the proper taking of eggs from a nest found in the wild is the commandment decided upon as being the least of all the Torah. Yet, Yeshua stated that if one is dismissive of this least commandment, and teaches others to be, consequences will reverberate throughout the Kingdom of Heaven for that one! At first glance, such a statement might seem unnecessarily severe. But if the commandment is further explored, more will come to light as to the Messiah’s strong stance concerning how it is approached. If all these criteria are met, only then is it Biblically acceptable to send away the mother and take the young. If any criteria are not fulfilled, this commandment cannot be performed until all are met. These very strict requirements are what goes into the reasoning for why this commandment, of all the 613 of the Torah’s edicts, is listed as the very least. The likelihood of one every being able to fulfill such a commandment is very scarce. Despite the scarce opportunity for one to perform this commandment, it did not stop Yeshua from holding accountable one who flouted it and taught others to do so, as well. The text tells us that performing this commandment allows our days to be lengthened. That is the physical blessing ascribed to those who perform it. However, each commandment has a physical and a spiritual nature to it. This means that there is an important spiritual significance attached to the performance of this commandment. One can take the young, but Scripture does not exactly say what to do with them. Are they to be eaten? Are they to be raised to be a captive source of future food / income? The Torah doesn’t tell us. All it says is we can take them under proper circumstances. This taking could even be in the form of lifting them from the nest and subsequently returning them, causing no harm to the young at all. It is the choice of the performer as to what they wish to do with the young that are “taken.” In this case, we can see that there must be a spiritual merit in performing the commandment. The spiritual purpose of this commandment is one that Judaism has attempted to ascertain. An unusual, but enlightening consensus was long-ago reached. The purpose of performing this commandment is all bound up with the coming of the Messiah! While it may seem bizarre that such seemingly innocuous-sounding directions as what to do with a bird nest when found in nature could be linked to so significant a thing as the advent of the promised Messiah, it does make more sense once we look a little further into how the commandment was viewed from the perspective of ancient teachers of Scripture. Firstly, the apparent basis for viewing this in a Messianic way lay in the presence of the phrase in Deuteronomy 22:7 that says: “You must certainly send away.” In Hebrew, it is the simple phrase of SHALLEYAKH TESHALLAKH “sending you shall send,” from the root SHALAKH “send” in the literal Hebrew. Messiah is not someone who just takes it upon himself arbitrarily to perform the role of the awaited Redeemer. Rather, it is the Holy One in heaven who sends Messiah. He alone knows who is worthy to rule the people of Israel in righteousness and give of himself so completely that redemption is affected through his sacrificial actions. Only the Holy One has the authority to choose and send that person to be the Messiah. It is in this way that the phrasing in the above verse links to the Messiah: the Hebrew word meaning “Apostle” or “The One Sent in Authority” is the word SHALIAKH and comes directly from the term SHALAKH “send” mentioned above. Messiah is the SHALIAKH “The One Sent” of the Holy One. Thus, the two-fold appearance of the term in the Hebrew reinforces the Messianic concept. This is bolstered conceptually in that the phrase appears in the Word only one other time – when Moses is being tasked to be the savior of the enslaved Israelites, and in his refusing to act as such, he cries out to the Holy One at the burning bush in Exodus 4:13 – “please do send by the hand of whom you shall send!” Although not pronounced identically as before, the two words are used in the same function, and in an apostolic fashion. Ancient Judaism proclaims the fulfillment of this least commandment has the unique spiritual reward of hastening the Messiah. In Midrash Devarim Rabbah 6:7, we read exactly how this was viewed to be a reward for performing the simple commandment. The Midrash quotes Isaiah 32:20 to validate its assertion. The spiritual concept behind this commandment is to speed up the coming of the King Messiah: by sending the bird, the Holy One might also, in His mercies, send the Messiah! As we are all indeed citizens of His Kingdom, He has promised us a King of His choosing who will come and rule over His Kingdom with trustworthiness and righteousness. Yeshua has proven Himself worthy of that throne by His living out the Shema and His flawless fulfillment of all the commandments of the Torah. Just like the bird that is sent forth in the performance of this least commandment, He will be sent forth to us so that the desire of the Most High shall be fulfilled in His Kingdom. If we should take the statement of Yeshua to heart that He made back in Matthew chapter 5:19, that the least commandment is still to be viewed as vital, then we will be able to appreciate its purpose being connected to bringing Him into our midst sooner rather than later. It will place us into the proper mindset of the Kingdom that Yeshua understood and lived: every Word of the Holy One is weighty in its own right, and should be sought to be fulfilled, for the spiritual worth of those fulfillments goes beyond what might be easily recognizable. It may sound like a strange thing for the Midrash to assert the idea that sending away the mother bird and taking the young hastens the coming of the Messiah, but this verse was viewed as connecting to the Messiah because the ancient Biblical view of the ox and the donkey was that they were Messianic symbols. Many times throughout the Word an animal is mentioned as symbolic of a person or a nation. In this regard, the ancient commentators saw in them a significance that was linked to the Messiah. For instance, in Midrash Bereshit Rabbah 75:6, the explanation of two different passages of Scripture that speak of the ox and the donkey are both elucidated as referring to the Messiah who was to come. The connection is that the ox is viewed as a “firstborn,” so that as the Priest Anointed for War, his role is sacrificial in nature, yet not in the Levitical sense. The Messiah as the Priest Anointed for War is the one who puts his own life on the line by going forth to the battlefield to intercede for the troops there instead of in the Temple. (See my study: ANOINTED FOR WAR). The ox is therefore a symbol for the suffering of the Messiah. In contrast, the donkey is connected to the King Messiah, for the Biblical text alluded to speaks of the coming of the ruler of Israel in the end of days, who rides upon a donkey. Messiah’s role then is the King, who has already suffered for the people. The reference to the donkey is therefore a reference to the coming of the King Messiah, who will reign over all of us in the Kingdom at the time of the Holy One’s choosing. Therefore, the text is viewed in highly Messianic terms, so that the lightest commandment performed hastens the coming of the Messiah to fulfill His role. The ultimate reward for the performance of the least commandment is a supernatural hastening of the coming of the Messiah to this earth as King in the Kingdom of Heaven. There is no way to explain how that can happen, but we do know that Yeshua explained that we should pray for mercies regarding future events in the great redemptive plan of the Holy One. We must be of such dedication to the Creator that we are ready and able to perform the greatest commandment in all the Torah, just as Yeshua took it upon Himself to fulfill it without failure in any way, so that He could rightly be crowned the King of His Father’s Kingdom. Likewise, although it is not a commandment we can just seek out to perform, if one should ever find himself in such a situation to fulfill the least commandment, he should know he is being given a truly unique and spiritual gift that has a special value to the process of redemption and the restoration of all things. ​The believer who has taken on the yoke of the Kingdom of Heaven has in this life the blessed opportunity to see and to connect the least commandment in all of Scripture to the greatest commandment in all of Scripture: loving Him with all that we are made of, so that the coming of the King who shall reign in the Kingdom of Heaven might be speedily, and in our days!